Salivary Hormone Testing: What is it? What do anxiety, fatigue, weight gain, low libido, muscle weakness, hot flashes, hair loss and sleep disturbance all have in common? Besides being a nuisance, they are all symptoms of hormone imbalances. Both men and women experience changes in hormone levels with age. Sometimes those changes result in unpleasant symptoms that demand attention, while often, the changes are more subtle – yet there is still an impact on overall health. At Pensacola Wellness we care about your health and finding the root of whatever issues you are experiencing, so we offer various hormone tests based solely on the needs of each patient. Saliva testing is an easy and noninvasive way of assessing your hormone balancing needs, and is proving to be the most reliable medium for measuring hormone levels. This testing method allows patients to collect saliva at home at specific times, which is important for accurately measuring hormone levels. Why do we test hormones in saliva? Steroid hormones in the bloodstream are 95-99% bound to carrier proteins, and in this form are unavailable to target tissues. Saliva testing measures the amount of hormones available to target tissues – the bioavailable amount. For this reason, saliva testing better relates to specific symptoms of excess or deficiency, and is a good option for monitoring hormone therapy. Unlike serum tests, saliva testing represents only the hormones actively delivered to receptors in the body. Clinically, it is far more relevant to test these bioavailable hormones and provide an accurate reflection of the body’s active hormone levels. 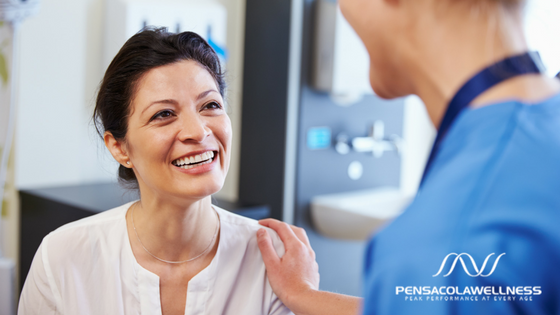 At Pensacola Wellness Solutions, we believe that individualized care is significant to each patient’s health. We do not take a “cookie cutter” approach, but instead, we address and evaluate based on each patient’s concerns and health issues. If you’re experiencing hormone imbalances, call us today to schedule an appointment for a salivary hormone test! Learn more about Tests and Screenings at Pensacola Wellness Solutions.